Mikini Services is a one man army, loaded up with weapons of mass-knowledge and experience from various embedded software and hardware niches and some experience with server backend development and operations. A heavy preference for open processes and solutions with freedom preserved permeates into to the decisions taken. Combatants are Mikkel Kirkgaard Nielsen, BSc EE, Bachelor of Science in Electronic and Electrical Engineering, graduated from Aalborg University Esbjerg in 2001. A personal drive for technical perfection and a non-satisfiable curious attitude ensures warm fuzzy feelings about the stuff done here. Find more details in the references below, or feel free to ask. 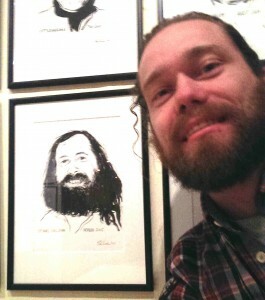 Me and RMS (Richard Matthew Stallman). Portrait by Peter Carlsen located at Apollo Brewery, Copenhagen, Denmark. Produced in October 2005 as an endorsement of the FreeBeer project. Stumbled upon this in May 2010. The primary operational domain is the internetional software ecosystem, but with practical and jurisdictional ties to Danish territory. A constant strive is to keep in touch with the trends of the industry but cheerish the past and have a lot of opinions about how stuff ought to be, all without prejudices and always observant and respectful of alternative ways of thinking. And on the large scale, accepting the dynamic and non-homogeneous universe as a playground of hyper-awesomeness. The revenue-philosophy is more along the lines of good business with good karma, than better business with bad karma. Mikkel is FSFE (Free Software Foundation Europe) fellow #2603, wanna join FSFE? Also a part of the team trying to keep the Esbjerg hackerspace/makerspace/fablab GeekLabs afloat. Here’s a stand alone PDF curriculum vitae (aka. CV). License: Unless otherwise noted, contents on this site is licensed under the Creative Commons by-sa license.